SINGAPORE - Singapore's population stood at 5.54 million as of June 2015, a 1.2 per cent growth from June last year, latest figures show. 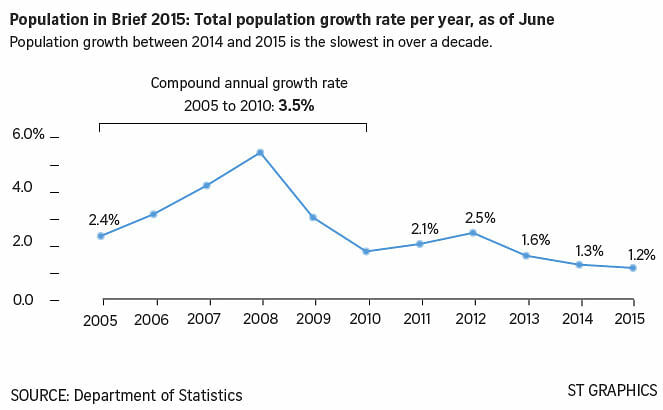 The pace of growth was the slowest in more than a decade, mainly due to the continued slowdown in the growth of the foreign workforce, according to a report released by the National Population and Talent Division (NPTD) on Wednesday (Sept 30). - 1.63 million non-residents. They include foreigners on employment passes, S passes, work permits, dependants of citizens, PRs and work pass holders, maids and foreign students. The growth in non-resident population slowed to 2.1 per cent in 2015, down from 2.9 per cent in 2014. This continues a downward trend seen in the last few years. The number of non-residents was 1.6 million in 2014. Close to half of the non-residents here were work permit holders who were mostly in occupations which found it difficult to hire locals, such as construction workers, said the NPTD report. The rest were dependants of citizens/PRs/work pass holders (16 per cent); maids (13 per cent); employment pass holders in managerial and executive positions (11 per cent); S Pass holders in sectors like retail, manufacturing and healthcare (11 per cent); and foreign students (4 per cent). "Businesses will continue to face a tight labour market. The Government will support businesses to shift towards skills- and capital-intensive ways to grow, so that businesses can continue to grow and succeed here, to create quality jobs for Singaporeans," said the report. The citizen population, however, crept up by 1 per cent, thanks to a rise in citizen births which were the highest in the last decade. There were 33,193 Singaporean babies born in 2014, although the year was not a particularly auspicious one to many Singaporeans for having children. That matched the record in the popular Dragon Year in 2012. As a result, the total fertility rate for residents rose to 1.25 in 2014 from 1.19 in 2013. The increase was seen across all ethnic groups. This, however, was still well below the replacement rate of 2.1. But in an encouraging sign, there were more couples tying the knot. There were 24,037 marriages involving at least one Singapore citizen in 2014, the highest since 1997. Hoping to further boost birth rates, the Government recently announced a slew of pro-family measures, including a more generous Baby Bonus package, larger Medisave grants for newborns and an extra week of paternity leave on a voluntary basis. But until there is a surge in birth rates, Singapore's population continues to age, with Singaporeans living longer and having fewer babies. Those aged 65 and older formed 13.1 per cent of the citizen population as of June 2015, up from 12.4 per cent in 2014. "There are more citizens in the older age groups today as the 'post-war baby boomers' enter their silver years," said the report. That would mean that there are currently 4.9 citizens in the working age band of 20-64 years for each citizen aged 65 years and above. A decade ago, the figure was 7.2.